We are two and half weeks away from Thanksgiving and seven weeks away from Christmas. Are you stressed yet? From now until the holidays are over, I will be focusing articles on simplifying all the worries that surrounds this time of year. I am going to throw ideas at you, make up a few lists, and inspire you to have a delightful holiday season. Are you ready? Simple 5-minute table centerpieces. Click on picture for details, descriptions below. 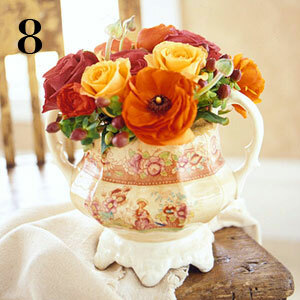 What are your centerpiece ideas and tips? Floating fruits in glass vase. Also good to mix the colors or use fall colors. Bold color fruits in serving bowls. Gerbera daisies in wheatgrass box. Pinecones in glass vase or other glass serving bowls. Fall wreath hanging from a ribbon. Pumpkins and foliage on cake dish and table runners. Vegetables tied to candle with ribbon. Use what you have around the house — serving bowls, antique china, glass vase, cake stands, platters, bottles, trays, candles. Use what is outside of your house — leaves, twigs, thin branches, berries, nuts, seeds, sand, rocks. Use what is in your grocery bag — fruits, vegetables, candies, nuts. Think colors — bold colors, fall colors, shades of white. 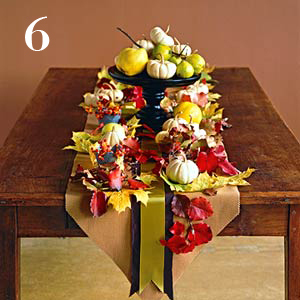 Table runners can be made from anything — wrapping paper, tissue paper, colored plastic wraps, scrapbook paper, butcher paper, fabric. Don’t make it too tall. It blocks people’s views and slows conversations.